Monarchy demonstrably travels faster than light, for the instant one monarch dies, the next in line to the throne inherits the power of the crown: indeed if we had a sufficiency of petty kingdoms to mess with we could use it as a basis for time travel, causality violation, and thereby an ironclad proof that P = NP. But I digress. 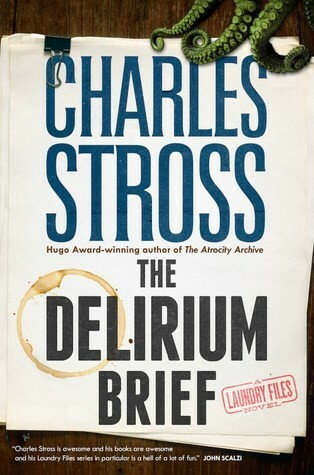 “The Delirium Brief” is written by Charles Stross. It is book #8 in ‘The Laundry Files’ series. This series mixes up science fiction, fantasy, the occult, parts of the Cthulhu mythos along with inanity and humour of ‘The Office’. It is a must read for geeks, especially those working in IT and corporates. There is a lot of IT mathematical humour along with pop culture references and the usual office jokes. ‘The Laundry Files’ is a series about a fictional civil services organisation — the Laundry — which protects the UK against supernatural threats. The premise is that advanced mathematics and computer programs work as spells to bring in extra dimensional entities that in turn resemble vampires, demons etc. Since the Laundry is part of civil service, the humour lies in the bureaucratic way of dealing with threats against the realm. Bob Howard is the protagonist and he has worked his way up the organisation from a minion to being part of upper management. I found ‘The Delirium Brief’ to be an average entry to this series. I was annoyed by the volume of angst shown by Bob Howard. There were a couple of events that changed the status quo which bring some variety back to the series. In conclusion, I would not recommend this to readers new to the series. If you are new, start with the first book and go in order. For readers familiar with this series, ‘The Delirium Brief’ is a passable entry. While it is not as much fun as the earlier ones, there are enough world changing events here that you have to read it.